We are located near Estonian National Park Lahemaa in Haljala municipality in Varangu village between the forests and fields, 11 km from the coast of Finnish Gulf. Mäehansu farm offers the possibility to create and learn ancient grandma's handicraft, accommodate in a B@B, cuddle with lambs, go wandering on forest paths and get aquianted to wild flowers. Just for my own pleasure I set up granny's weaving looms and that has turned up to be a weaving loom room where are 4 weaving looms and where weaving lessons take place. Call me and ask to set up your own looms! Our farm has about a dozen goats and a whole flock of sheep. I pet them and feed them hay, they return the favour with wool and milk. Wool I weave into fabric and milk I make into cheese. ​Cheesemaking takes time and patience but who wishes, can make their own cheese wheel. When the herd has grown too large, it's time to stick some of them into the oven. ​For meat and recipes, talk to the lady of the house. 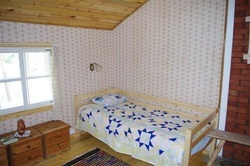 There is B@B accommodation in the farm with 2 bedrooms and 6 beds altogether. Come and sleep in forest with all facilities! Turn to Karepa road from Haljala- Võsu road and drive for 5 km. Then between the fields by Salumäe tee bus stop turn left. Our big red house in in 2km in a forest.